Developed by Microgaming, Pharaoh’s Tomb is a five-reel twenty-payline video slot, which theme revolves around Ancient Egypt. A versatile bet size with a $400 maximum wager will appeal to low-bettors and high-rollers alike. Featuring wilds, scatters and a highly-rewarding bonus game, the slot can award you a fixed jackpot of x3000 times a bet. Pharaoh’s Tomb is available without registration and at no cost to you. The reels are set against the backdrop of a sandy desert and pyramids to immerse a player into the atmosphere of long-ago times when mighty pharaohs ruled the land of Egypt. The symbols in Pharaoh’s Tomb fit the theme, including even poker card symbols that are designed with an Ancient Egyptian twist. On the reels you will come across the symbols of a treasure map, a backpack, a sphinx, an archeologists, and some other themed icons. They are joined by traditional playing card symbols from 9 through to ace. The playing cards are low-pay icons that yield x5 to x200 times a line bet if three, four or five of them spin in across the reels. The Treasure Map and Backpack are mid-pay symbols that produce a win of up to x500 times a bet, for 2 to 5 of a kind. 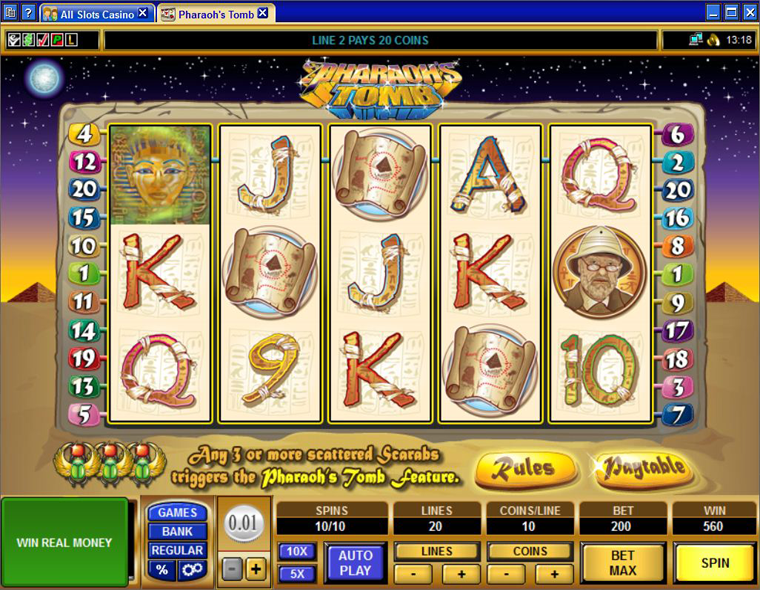 In fact, all the themed symbols pay out if at least two identical images appear on a payline, which provides you more winning opportunities as compared to the games where you have to roll up three of a kind to get a win. The highest paying icon is Archeologist. If these five hit across a payline, you take away the slot’s grand prize of x3000 times a line bet. the number of paylines to bet on (min/max): 1/20. Overall, the minimum and maximum bets allowed per spin amount to $0.2 and $400 accordingly, with all lines active. The Pharaoh acts as wild symbol. It substitutes for all regular icons to complete a winning combo and doubles all wins when substituting. There is only one limitation: a wild is reserved for reels #1 and #5 only. The scarab symbol is a scatter, with three of them landed in any position across the reels triggering a multi-tier bonus feature. You are taken to the first pharaoh’s tomb, and your aim is to go through three of the tombs to get the ultimate treasure of the pharaoh. You’ll have to pick one of three sarcophagi in every tomb. If you find a key underneath the sarcophagus of your choice, you advance to the next level. Each time you find a key, you get a random cash prize. 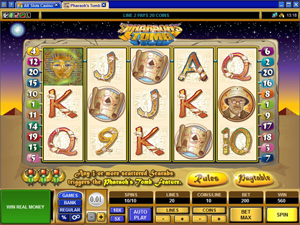 On passing all the three tombs, you are awarded a win of x100 times your bet in the base round that has activated the feature. 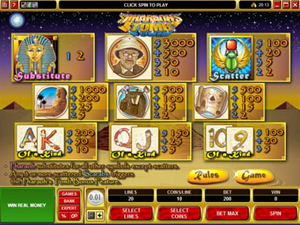 Pharaoh’s Tomb is a nicely designed five-reel slot powered by Microgaming. Its versatile betting options will take the fancy of high rollers and first-timers as well. You stand the chance to grab a fixed jackpot worth x3000 times a bet, and get a x 100 multiplier in a bonus round.